Ceremony honors fallen sailor. Pomona man died while serving in Iraq. 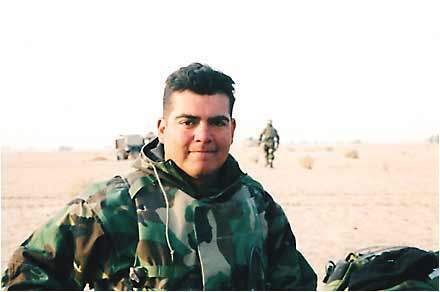 Caption for first photo: Cesar O. Baez poses for a photo in Iraq. Cesar died June 15, in the al-Anabar province in Iraq as a result of enemy small arms fire. 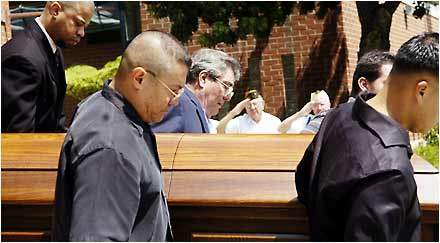 Tuesday, June 28, 2005 - CLAREMONT - It was Cesar O. Baez's job to tend to wounded Marines on the front lines in Iraq. The Navy corpsman grew up in Pomona, dreamed of being a doctor, was father to three little girls with big brown eyes like their dad's and was waiting for the birth of his first son. 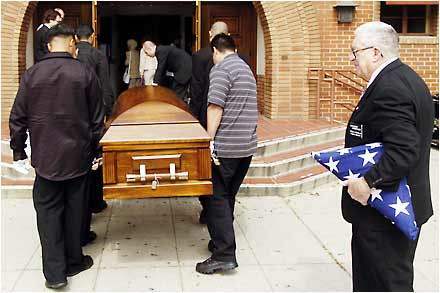 He went to Iraq to serve his country and died there during a combat mission near the Syrian border. Hundreds of friends, family members and strangers said goodbye to him and thanked him for his sacrifice Tuesday at Our Lady of the Assumption Catholic Church. "I will miss my son more than words can express," said Cesar Baez, Baez's father. "He was a great child, hero and father." Hospital Corpsman Second Class Baez was killed June 15 by small arms fire while he was with a Marine patrol conducting a combat operation in the al-Anbar province. 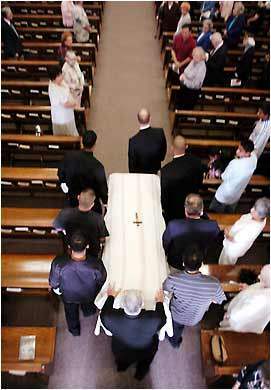 The 37-year-old corpsman's wife, Rosanna, pregnant with their fourth child, walked solemnly behind the casket which was carried by his father, two brothers, friends and family. 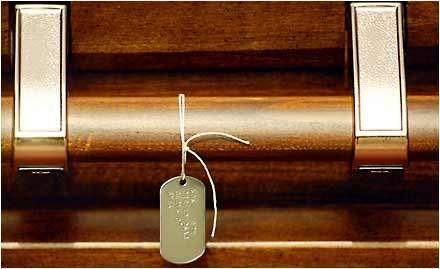 Cesar Baez clutched the rail of the casket, where his first born son's dog tags hung loosely from its side. His mother, Bernardina Baez, tearfully watched as her son was carried away from the same church in which he was baptized. On Monday, Baez had been honored with a full military funeral and gun salute at Camp Pendleton, attended by hundreds of mourners and servicemen. 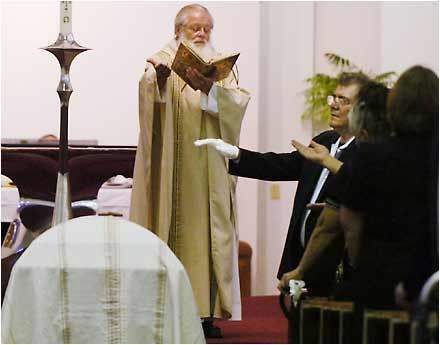 Tuesday's service was mainly attended by family and friends. "Monday was the hardest day for me," Baez's father said crying. "When I heard that bugle playing it was very difficult. It's too hard to say goodbye." 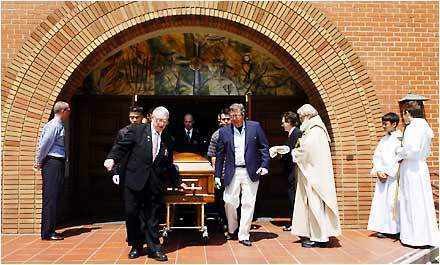 Residents from around the Inland Valley also attended the funeral Mass to offer comfort to the family. 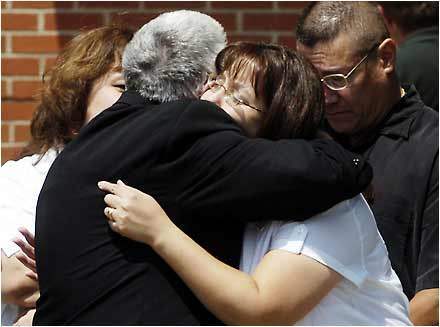 One by one, strangers walked up to Baez's parents and wife, hugged them and thanked them for their son's valor. "I can't find the words to say thank you," said Dr. Bob Carpenter, a WWII veteran, who lives at the Western Assemblies Home in Claremont where Bernardina Baez has worked for more than 20 years. "Your son is a true hero." The Rev. Thomas Welbers prayed with the mourners and asked them not to forget the sacrifices that Baez and others like him have made. 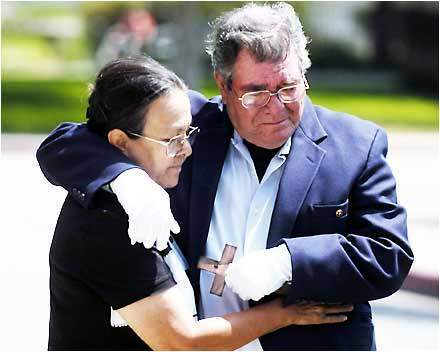 "In Cesar's hands when he touched the wounded ... the healing power of Christ was in his hands," Welbers said as he spoke of the 14-year veteran whose job it was to treat wounded Marines and enemy soldiers. 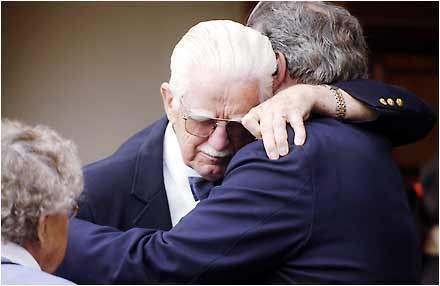 "We are here to celebrate that Cesar did the same thing Christ did Cesar found the courage to die for others." Cesar Baez said he has found hope in the grandson who is to be born in September. On Thursday, Gov. Arnold Schwarzenegger remembered Baez for his bravery and courage. In honor of Baez's sacrifice, the Capital flags were flown at half-staff. "Maria and I want to join all Californians in expressing our sympathies to Cesar's family," Schwarzenegger said. "He made the ultimate sacrifice for his country and we are forever indebted to him for his service." As the casket was carried out of the church, five Veterans of Foreign Wars from World War II stood under the blue sky and gave the young soldier one final salute. The family plans a private internment. Sara A. Carter can be reached by e-mail sara.carter@dailybulletin.com or by phone at (909) 483-8552.